Hidden in the salt spray from waves crashing on the beach are clues to our planet’s future. 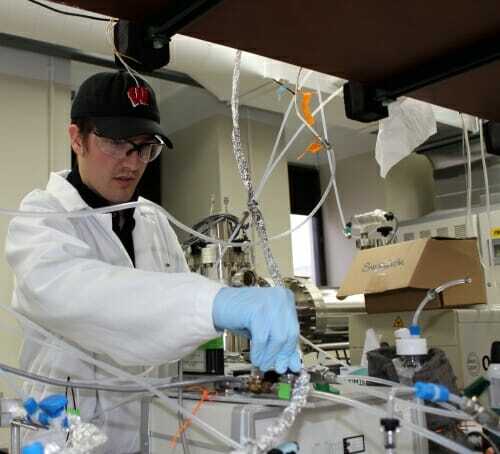 Chemists at the University of Wisconsin–Madison are turning to where the ocean meets the sky to study how our past, present and future climates are affected by a complex aerosol made up of seawater, air and bits of organic matter from the organisms that call the ocean home. The researchers are members of the Center for Aerosol Impacts on Chemistry of the Environment, or CAICE, a National Science Foundation-funded collaborative dedicated to unravelling the impact of these aerosol particles on air quality and climate. Because oceans cover 70 percent of the planet, it’s a daunting task. “There’s a lot of water — a lot of ocean — and a lot of wind,” says Joseph R. Gord, a postdoctoral research associate at UW–Madison, who works with CAICE. CAICE recently received $20 million from the NSF to fund its second five years, with $3 million slated for UW–Madison. Based at the University of California, San Diego, CAICE is a collaboration between 12 universities and institutes around the country. To investigate past conditions, CAICE scientists constructed an ocean-interface model to recreate the chemical composition of sea spray in the lab. This allows the researchers to alter conditions and simulate different geologic time periods or environmental factors. Changing ocean temperatures, an increase in ocean acidity, pollution and harmful algal blooms all alter the composition of this aerosol zone and may affect weather patterns and human health. 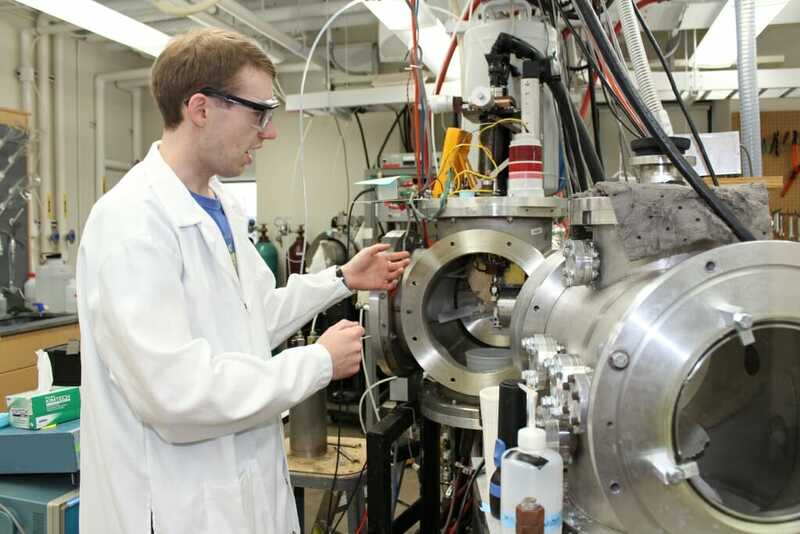 The new NSF grant will focus the project on three main parts: particle production; chemical reactions at the water-air interface; and how particles affect cloud formation. 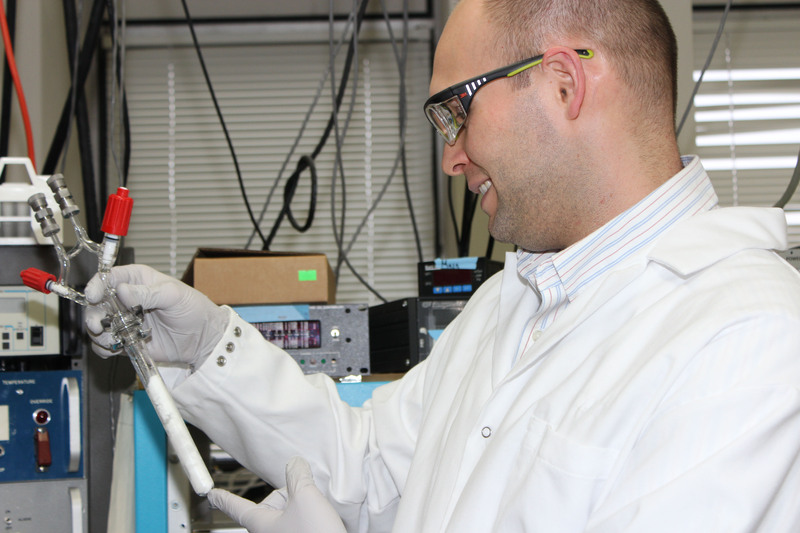 UW–Madison researchers focus on chemical reactions between aerosol particles and atmospheric gases. One class of gasses, known as reactive nitrogen compounds, can greatly affect the concentration of oxidants in the atmosphere. These oxidants, such as ozone, are critical for the accuracy of chemistry and climate models. “By understanding the behavior of these molecules, we equip and enable people who study other climate processes in-depth to make better predictions for and models of the atmosphere,” says Gord. Concentrations of reactive nitrogen compounds in the atmosphere also affect the amount of particulate matter, which, along with ozone, can take a toll on human health. Both ozone and particulate matter are monitored by the Environmental Protection Agency. The CAICE collaborators build upon a rapidly increasing collection of data and upon a shared interest and experience in chemistry and climate science. This work was funded by the National Science Foundation Division of Chemistry through the Center for Aerosol Impacts on Chemistry of the Environment under Grant No. CHE 1801971.